Retail Distribution is different. We understand that! Logistics Bureau is a management consulting firm that has significant experience in Retail Distribution. So whatever your Retail Distribution consulting needs, Logistics Bureau can help you. Trade Off Examples. This shows how for most retailers there are a number of key trade offs to be considered. It’s all about total end to end cost, not unit buying costs! Retail Supply Chain Forum. 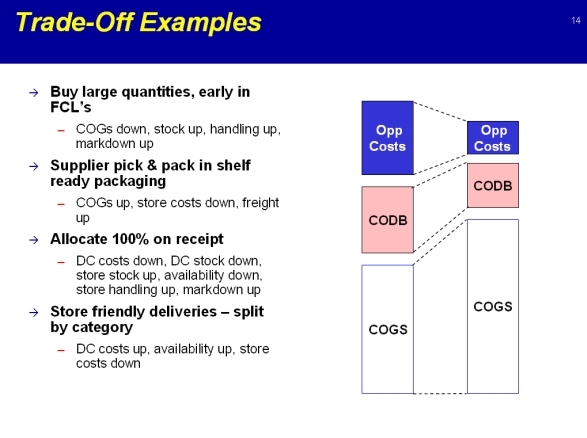 For most retailers the largest Supply Chain cost is Cost of Goods Sold (COGs). Hence the need to focus on buying ‘well’. 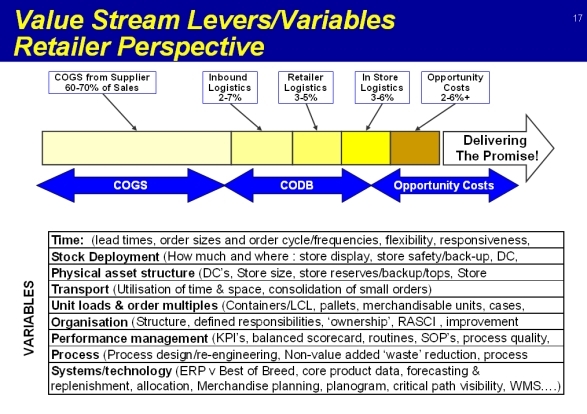 But there are a mass of other ‘levers’ that can be pulled and pushed to improve retail supply chains.